...Talk about being right on the beach - we are at the beach...not .2 or .3 walk. just pack your beach stuff and walk a minute from the stairs of our villa to the beach. OUR PHASE III JOHN FRIPP VILLAS ARE SET UP QUITE DIFFERENTLY THAN THE PHASE I AND II JOHN FRIPP VILLAS AND OFFER A MORE HOMEY LAYOUT WITH A 40 X 30 FLOOR LAYOUT on main living floor and an expanded top floor that has four twin beds....no bunk beds and a full tiled shower in its bathroom. The other two earlier built phases are structured more with a "tunnel effect" long and narrow...The ocean looks like it is in your villa as you eat in our newly decorated dining area or play cards at the game table in the living room. Our kitchen is fully-equipped and has Corian countertops. All the appliances are in great condition. Each bedroom has a full bath and two of the three bedrooms have excellent views of the ocean as well. Fripp is an ecofriendly spot with loads of wildlife to view including all types of birds, roaming free deer,loggerhead turtle nestings, alligators, racoons and a great recreation/wildlife program for kids to enjoy and learn. More than likely if you are visiting in the late Spring or Summer, hou will have opportunity to see loggerheads laying eggs or see the hatchings. Golfcarts are the most popular type of transportation on the island and of course is biking too since we have bike paths throughout the island. 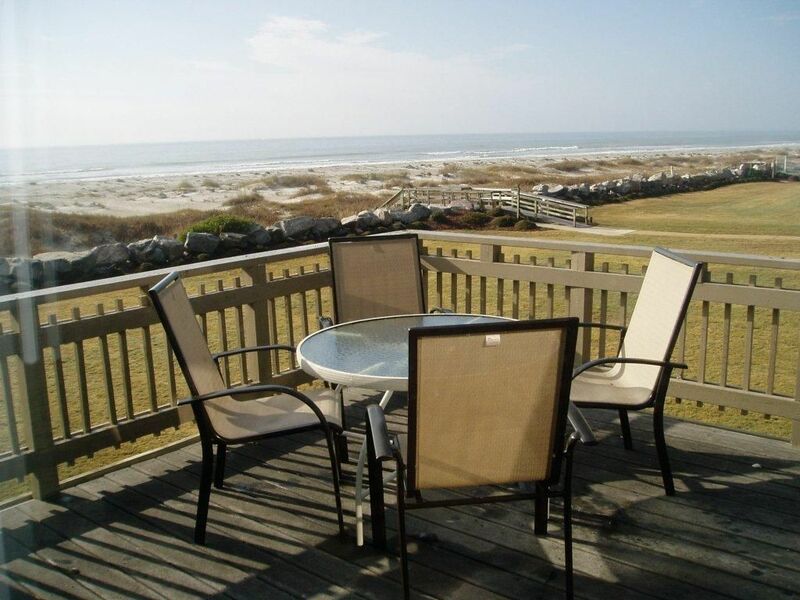 Fripp Island is only three miles long so everything is close by. We have two golf courses, Ocean Creek being open just 22 years is a Davis Love signature course, and the other course called Ocean Point, is a true ocean/links type course . Both will test your skills, especially if the winds pick up.Ten tennis courts which are across the street from our villas;a great recreation program for the kids, rental golf carts, fishing boat rentals, and several pools make Fripp a family delight.There is both an adult pool and an olympic size pool in front of our villa. Right next door to our villa is a fast food center offering not only ice cream, but pizzas,mexican entree and more. Many people come to Fripp to just relax too. The city of Beaufort is just 19 miles away and offers a wide variety of things to see and do. Parris Island is nearby as well with its Marine museums and tours available.Hunting Island State Park is the next island and offers a lighthouse to climb and see the ocean views plus a great nature center. There is horseback riding available on St. Helena Island just 15 minutes away. * Bedroom #1 - Queen bed. * Bedroom #2 - Queen bed. * Bedroom #3 - four twin beds. We actually bought our villa 20 years ago as our retirement home and after three years decided to purchase a home on Fripp and keep our villa as a rental unit. Our villa is located next door to an adult pool and a very large pool for adults and kids. Next door is the Beach Club area with a restaurant and a food court (ice cream too). The Sand Bar bar is there as well as the ocean view sports lounge, yet we are still secluded from all the activity. The tennis courts are across the street from our villa. 1 bathrm. has a tiled shower, the other two have regular sized tubs. Accommodations at Bob & Barbara Hess' villa are great. Everything you need is provided except for consumables. There are a couple of beach chairs, some boogie boards for use at the just steps away beach. The ocean view is marvelous. When we left Fripp Island on Saturday it was sunny and 74 degrees. When we arrived home in Indiana, on Sunday, it was 32 degrees with snow. Should have stayed longer. Great location. Lots of room. The owners live on the island and were very responsive and helpful. There are three bedrooms, each with its own bathroom, which is great. You can walk or bike to anything. The condo has great ocean views from the living room, eat-in kitchen and 2 of the 3 bedrooms, as well as from the deck. We had lots of room here for our family. Loved the view. We all had a great time. This place had plenty of room and all the comfort of home! I would recommend this place to all and we plan on coming back again. Very nice stay. Excellent location and fantastic ocean views!! We planned a short weekend getaway, and The Hess’s villa was spacious, and absolutely perfect for the 3 of us couples! The well equipped kitchen suited all of our needs. All beds and furniture were comfortable, and townhome was very clean. Many thanks to Bob for sharing his lovely villa with us! We hope to return soon! This was our second time visiting Fripp Island and our first time staying at the Hess' place. We loved it and hope to stay here again. The location is ideal. You can see and hear the ocean from the villa. There is a spiral staircase on the porch that brings you right to the boardwalk to go to the beach. The kitchen is great! Nice and big with a table overlooking the ocean. We made a lot of meals there and had all of the things we needed to cook a great meal. The two bedrooms on the main floor had comfy queen beds and attached bathrooms. One room overlooks the ocean. The kids loved the spiral staircase leading up to the open bedroom space with a couch, TV, and bathroom. The living room is large with tons of seating. There are also plenty of books throughout the house to read on the beach. There are beach chairs available too. This was a wonderful trip for our family! Our girls are 11 and 14 and loved swimming in the ocean, seeing dolphins, collecting seashells, and petting the deer that visited every night. We had friends join us for 2 nights and there was plenty of room for all 8 of us. Thank you Hess family! Hope to come again!